Miroslav M. Begovic has been elected president of the IEEE Power and Energy Society, the third largest in IEEE with over 28,000 members. 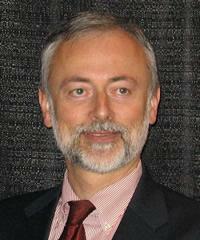 Effective January 1, 2012, Dr. Begovic became president-elect, a position that he will hold for two years. He will then serve two years as president and two years as past president. During his tenure in this role, Dr. Begovic will chair the IEEE PES governing board that directs the financial and administrative activities of the society. A professor in the School of Electrical and Computer Engineering at Georgia Tech, Dr. Begovic has been heavily involved in IEEE PES technical committees for over 20 years. He has served as a working group chair and a member of numerous working groups in the Power Systems Relaying Committee and as a member and chair of the PES Emerging Technologies Coordinating Committee. Dr. Begovic has also held various PES administrative positions, among them chair of the Atlanta chapter, which is the largest in the U.S.; chair of the Student Activities in Power Engineering Education Committee; secretary of the Meetings Department; chair of the Constitution and Bylaws Committee of the PES Governing Board; and as the Society's treasurer.